you must choose a 'background' which determines what quests you will have access to. 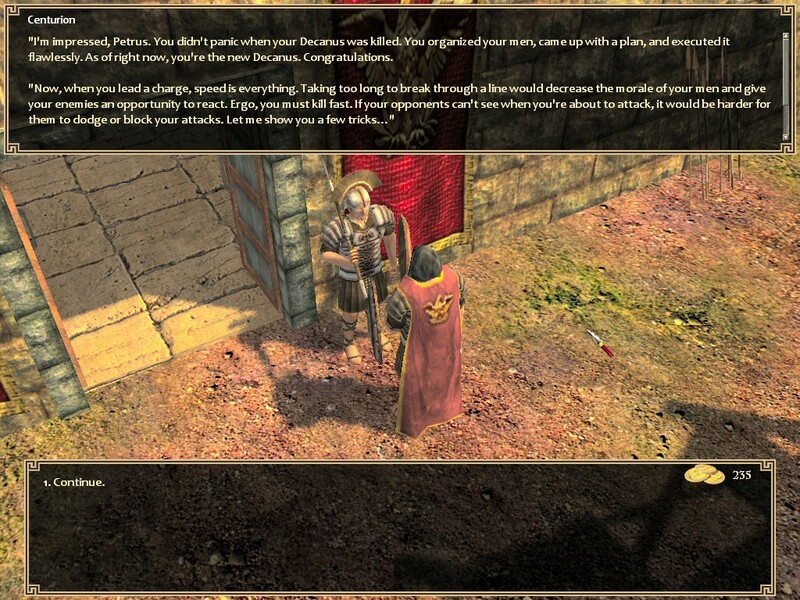 You can choose between Mercenary, Praetor, Assassin, Thief, Loremaster and a few other backgrounds. You set the starting abilities - strength, dexterity, constitution, perception, intelligence and charisma - using a point-buy system. So I created my Conan with the maximum strength possible (10) and I put my skill points into the hammer skill (from playing through the earlier combat demo, I thought hammers were very good). But the thing is, I didn't feel like Conan while playing for the first time. I felt weak. It seemed as if every other fighting character also had 10 in strength. The reason for this was that every obvious quest accessible in the beginning of the game led my character to a horrendous fight, and a premature death. You can assault a fortified mining outpost, assault the camp of a group of raiders, or assault a guarded merchant caravan (1st quest with the imperial guards). I realised later that there are a few easier fights you can do prior to attempting those quests. Early on I missed the easier fights because it seemed that all locations of interest were accessible from the local map. Actually, if you move through the city only by clicking locations on the local map, you're going to miss some important content and fights. You have to make your character walk through the various streets to trigger this content. Another thing I realised was that the 'Block' skill is better than the 'Dodge' skill if you want to take advantage of heavy armour. So I made another character, this time specialising in Swords, and Block. And this character had a good time. It seemed like he would master every encounter, crushing all his enemies under his blade. 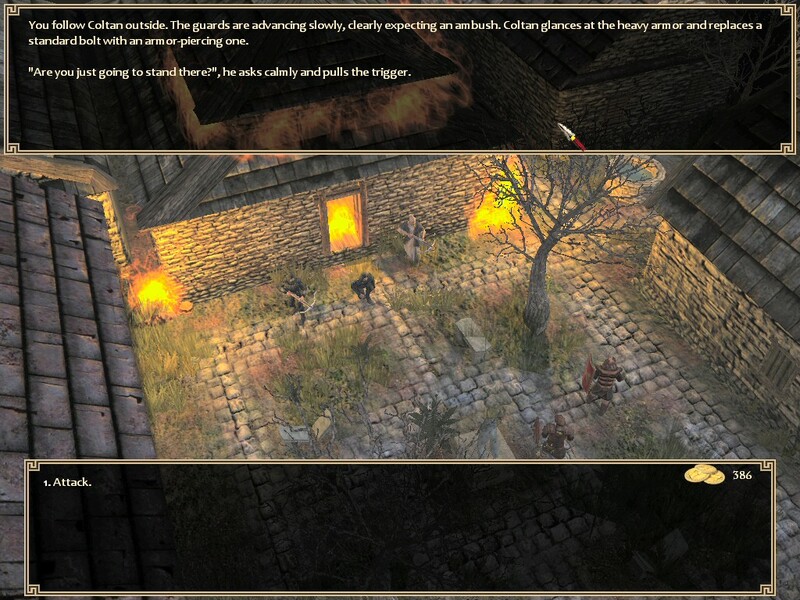 Which brings me to another thought: when playing Age of Decadence, you have to leave all moral concerns aside. In this game, fighters must take every opportunity to kill a character, in order to gain skill points and treasure. It doesn't matter if the victims are completely innocent. So how far did my Sword character go? Very far. He became a friend of the imperial guard commander and overthrew the city's king. But then he was captured and caged. Then he was given a chance to escape. But before he could escape he had to kill two guards, while being completely naked except for a dagger. Since the character had put all his skill points into Block and not Dodge, he had approximately zero chance to survive. You need a shield in order to block attacks. So I made a new character, this time specialised in Axes and Dodge. His weapon was the two-handed axe. Again, this character was very successful. He even managed to defeat the group of seven raiders. But he completely failed to defeat the mining outpost, even after poisoning the food of its occupants. Next, he joined the imperial guards. But then he completely failed in the mission to overthrow the king. At first I thought that he failed because 'Dodge' is inferior to 'Block' but that was not the real reason. No, the real reason was that my axe-wieder had intelligence 4, while my swordsman had intelligence 8. 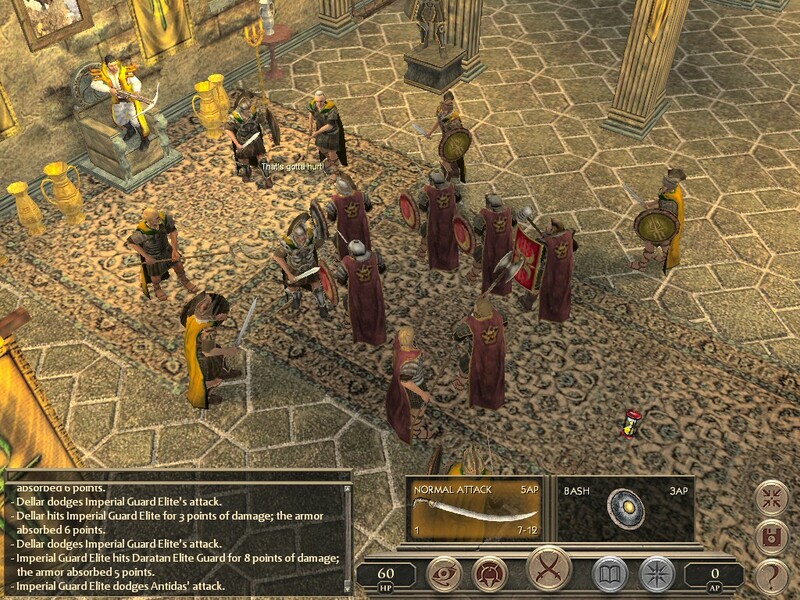 Because of the higher intelligence, my swordsman had impressed the imperial guard commander and in return my character had been showered with rewards. My axeman was dumb so his life was made incredibly harder. I read on the official forum that if your intelligence is at least 6, your fighter receives a boost to the weapon skills, a set of armour, and elite guards in the mission to overthrow the king. If your fighter has intelligence 4 or 5, you get no reward and the guards that help you in the mission are much weaker. Now from these two examples - the naked fight and the reward for intelligence - I think we can draw the conclusion that the game tends to reward certain choices in a very arbitrary fashion. I don't mind that the game world is a very cruel world where everyone is scheming to gain an unfair advantage over others. The Dark Sun world is like that too. But I think it's annoying that the world lacks coherence. It would be coherent for the imperial guard commander to give a little extra reward (e.g. the armour set) to the player character if he had been particularly smart in a mission. But it's not coherent for the commander to decide that the player should lead the next mission without receiving training or properly trained allies. Similarly, it's not coherent for the commander to recommend that the player character fight naked with a dagger when the character is actually specialised in another weapon, and not in Dodge. The reward for intelligence is a bit like having a D&D game where you play a wizard and, at some point in the adventure, a NPC wizard offers to provide 10 high-level magic scrolls to the player character, but only if he has a strength of at least 13. Why should a wizard be required to be strong, in order to gain a major advantage? Likewise why should a pure fighter be required to be smart. In a pen and paper RPG, character-development choices are never wrong because the game master can adjust the game on the fly to make sure that everyone enjoys the game. It would be nice to see the same thing in a video game: to know that no matter what combat style you have chosen, it is a viable choice which will not create a major obstacle for the character down the line. When it comes to the bad points I should also mention that I thought the game was much too dark (no gamma slider), too slow to load a saved game, and too slow to display combat animations. There is an animation speed slider but you can only set a double animation speed at the most. Even this is much too slow. Please allow a much higher value for animation speed, like x10 or x20. The game uses acronyms it doesn't explain. For example I know that THC means 'to hit chance' but it could have meant two hand combat. 'vs DR 1' is not explained anywhere. I would prefer if the game was in pure top-down 2D, but that's just me. Finally the game contains a memory leak which forced me to restart my computer from time to time. Now for the good points I would say that the game has a certain aura. The aura of a game that has been worked on for a very long time. 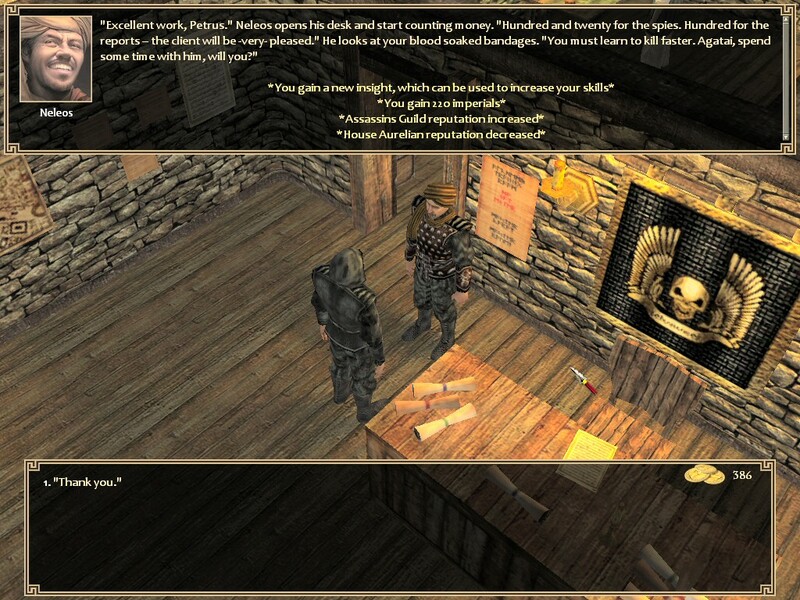 It has good animations, nice graphics, and it's very well written. I've found that the accessible quests are very different if you play an assassin, a praetor, or a mercenary. Combat is very interesting and the quests are interesting. I think anyone who likes turn-based combat should try this game. This is a beta version so it will get better. Presumably you had enough Dagger points from the synergy with Swords and enough Dodge points from your Dexterity and from any skill points you collected in the previous quest. I started with average Dex (since heavy armour negates the Action Points) and placed most skill points into Block. I skipped a lot of fights with that character. Anyway, I played through with an assassin yesterday and I had a good time. He was using dodge and the two-handed axe, not the traditional assassin gear. Defeated every battle, got the Terminator title, ended up with Fulvio as the only survivors of the raid against the imperial guards. What background do you prefer? Luckily you can actually change the animation speed beyond what is available in the game options by editing "prefs.cs" file. You can find this file in the same place where aod stores saved games. Find the line "$pref::Video::animationSpeed" and replace the current value. I'm using "8" and going past that seems to cause the game to crash occasionally. 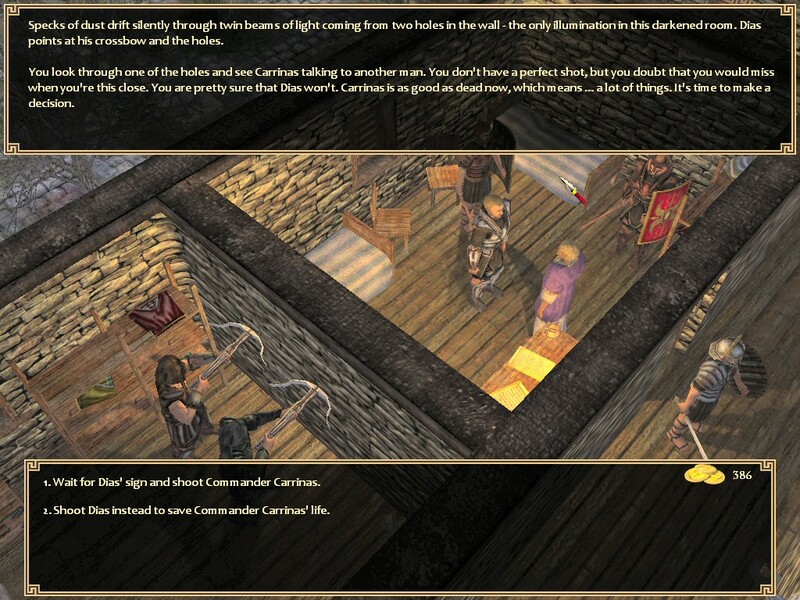 This really makes the bigger battles much more bearable when you don't have to wait ages watching npcs do their thing. BlueSalamander wrote: Presumably you had enough Dagger points from the synergy with Swords and enough Dodge points from your Dexterity and from any skill points you collected in the previous quest. I started with average Dex (since heavy armour negates the Action Points anyway) and placed most skill points into Block. I skipped a lot of fights with that character. Defeated every battle, got the Terminator title, ended up with Fulvio as sole survivors of the raid against the imperial guards. What background do you prefer? In hindsight I'd go with 8 DEX and put the one point into either PER or INT, probably PER. I missed out some skill points by not finding the encounter with some squatters in one of the towers (need 45 crafting or so to trigger that) and not attempting to infiltrate the palace going the critical strike route. You need well over 50 CS to do that but for each successful CS-kill your CS raises by one. Neat. In the end you have to fight a centurion, very difficult but that guy drops massive steel armor. But with a combat-centered character, how can you afford to spend the points on anything but [primary weapon|dodge or block|critical strike]? My main gripe with AoD is that it's so brutally difficult, I never feel like I can diversify my skills even a little bit. There are many ways to play it. I prefer crafting at 50 at the very least. it gives you an edge, your weapons are better so you can afford to hit less often, your armor has higher DR, so you can afford to get hit more often etc. On the other hand I've heard people have completed the game winning all combats without any defensive skill whatsoever, just with crafting and brutal offense (weapon skill) etc. Offense is the best defense, sometimes. I also missed the squatter encounter, and didn't try to infiltrate the palace. I think the local map should have a shortcut to every place where something can happen. Where do you get the iron to craft weapons? Never had enough to craft the 2-handed axe, but I could reduce the dodge penalty of a Studded Barbari armour. BlueSalamander wrote: Where do you get the iron to craft weapons? Never had enough to craft the 2-handed axe, but I could reduce the dodge penalty of a Studded Barbari armour. By killing people and decomposing their iron or steel armor/weapons. The raider boss should have iron stuff. Around Teron were nobles you could force-attack and kill, each one carrying a steel dagger. The guards didn't show up when you killed them. Dunno if they've changed that by now. The aurelian outpost captain had steel praetor armor. Kill them, loot them, go back to town! Return to the outpost which the aurelians have barricaded now and kill the rest. Report your success to Dellar. Now house Daratan has taken over the mine. Go back to the mine and kill them too! Hahaha, another set of steel praetor armor. Profit! Infiltrate the palace. you need to de-equip your armor (to remove sneak penalties) and probably spend a couple of points in sneak to make the sneak check (iirc 28) to enter the place. Then always go the CS route. Your starting value should be 50 before entering. Each time you CS someone, your CS increases by 1. In the end you have to fight a Daratan centurion with complete steel outfit ripe for the looting. PER=THC, your PER of 4 is bad. The more PER you have the less skillpoints you have to spend on your weapon skill to raise THC. Shoot for 8 or at least 7. Your DEX is far too high. The armor that allows for AP12 has hardly any DR. otoh your throwing THC will rock with such high DEX, so make use of nets and handoxes! decomposing their iron or steel armor/weapons. Ah, I see, you have to drag the armour and drop it onto the empty slot in the crafting screen. Go back to the mine and kill them too! You can raid that place two times? But that's not going to make the Daratans happy. The more PER you have the less skillpoints you have to spend on your weapon skill to raise THC. Shoot for 8 or at least 7. Ah, but I wasn't planning to use throwing or ranged weapons. With Dex 12 you can do two normal attacks with a two-handed axe per round and you get a higher dodge. Studded Barbari offers DR 3 with AP 12 and dodge penalty 5%. Intelligence seems to be a very good choice to focus on. Dex and Con are good. Per is good if you want to use nets. Strength doesn't seem to help much. Charisma, I guess that gives you a few extra dialogues and rewards.